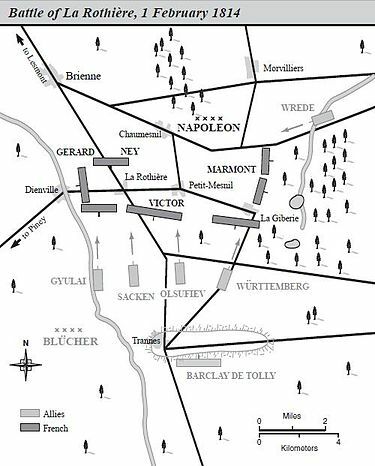 Napoleon was uncertain of the positions and strength of his opponents after his victory over Prince Gebhard von Blücher’s Army of Silesia at Brienne on 29 January 1814. He was heavily outnumbered, so aimed to attack only detached Coalition forces, trying to avoid battle with the main enemy forces. Blücher and Schwarzenberg decided to attack Napoleon on 1 February. Blücher was given command of 53,000 men, with the corps of Prince Fabian von Osten-Sacken and Count Zakhar Olsufiev being reinforced by two corps of Schwarzenberg’s army. Prince Karl Phillip von Wrede’s 26,000 Bavarians were to threaten the French left, with 34,000 Russians under Prince Mikhail Barclay de Tolly being held in reserve. About 6,000 of the reserves would be committed, giving the Coalition 85,000 men in the forthcoming battle against 45,000 Frenchmen and 128 guns. F. Loraine Petre argues that ‘it is almost inconceivable’ that Napoleon would have intended to fight defensively on an open plain when he was heavily outnumbered, especially in cavalry. He was uncertain of the enemy’s position and manoeuvres, but suspected that they intended to pin him at Brienne and attack at Troyes. He therefore ordered a retreat towards Troyes. Around noon Napoleon received reports that suggested that the Blücher’s army was advancing on La Rothiere from Trannes. He decided that he had no choice but to stand and fight, even on unsuitable ground. He recalled Marshal Michel Ney’s corps, which had already started to retreated, but for now there were only 34,000 French troops on the battlefield. Blücher’s attack began around 1 pm. General Étienne Nansouty’s cavalry charged Russian artillery that was firing high, killing a large number of gunners. Sacken brought up his infantry, but a brief pause in the snowfall revealed them to the French artillery and cavalry. Nansouty charged and his troopers initially swept away the enemy cavalry, but were then caught in the flank by fresh cavalry and defeated, with the loss of 24 guns. An immediate Coalition advance might then have broken the French centre, but the snow obscured Blücher’s view of the action, and the chance was gone by the time that he learned of it. The French were able to resist Coalition attacks until around 4 pm, when their left began to buckle under attacks from Wrede’s troops, which took the village of Chaumesnil. In the centre Barclay’s fresh troops almost took La Rothiere. Napoleon, faced with two simultaneous crises, reacted quickly, organising two counter-attacks. La Rothiere was retaken, whilst a desperate fight took place on the French left. The arrival of Wrede meant that the French were beaten, and Napoleon ordered a retreat to Lesmont. Aided by dusk and the snowfall, he was able to break contact all along the line. Both sides lost about 6,000 dead, wounded and prisoners, with about 2,000 Frenchmen being captured. The French also lost 50-60 guns. A lack of intelligence about the enemy and poor weather meant Napoleon had been forced to fight a superior enemy, something that he had wanted to avoid. Chandler says that ‘there is little but praise’ for the way in which he fought the battle well and extracted his army. The Coalition might have won a victory that would have decided the campaign had Blücher been given full control of the reserves. However, Petre notes that the Austrians did not want ‘a really decisive victory’ as they had not ruled out a political solution that would leave Napoleon in his throne. D. Chandler, The Campaigns of Napoleon (London: Weidenfeld & Nicolson, 1966), p. 960. F. L. Petre, Napoleon at Bay 1814 (London: John Lane, The Bodley Head, 1914), p. 30. Petre, Napoleon at Bay 1814, p. 37. I’m amazed every time I visit here as to the treasure trove of history you’ve accumulated, such great work, Martin.